Arthur Miller’s Death of a Salesman is one of the most staged and best loved translated plays in Hong Kong. It was first introduced to the local audience by Chung King-fai in 1964. Since then, it has been mounted in Hong Kong 11 times. Salesman is considered almost by consensus a classic of Western drama. It was among the first contemporary American plays to be staged in the territory and the most famous, if not the most familiar, to the Hong Kong audience. During interviews with local practitioners, many of them identified Salesman as the most popular foreign play without hesitation. 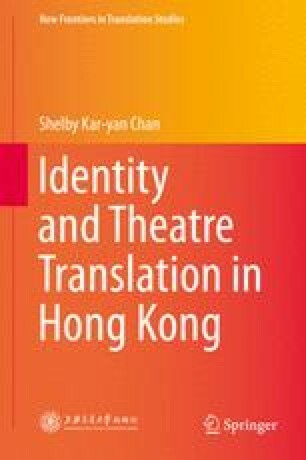 All the productions in Hong Kong were invariably faithful renderings of the original play, in terms of setting, language and performance style. Dominic Cheung, who mounted Salesman on the Hong Kong stage in 1995, and Hardy Tsoi, who did so in 2006, both insisted that the play must be produced in its entirety and that it could not and should not be changed. They were confident that the story of Willy Loman, the pitiful American salesman of the 1940s, would resonate with the present-day Hong Kong audience (Cheung 2009; Tsoi 2009). The story of Salesman, as confirmed by the play’s producers in newspaper coverage and interviews, is in many ways similar to the situation of Hong Kong, and its protagonist Willy Loman has become a local cultural icon. All quotations from Death of a Salesman come from Death of a Salesman: Text and Criticism, ed. Gerald Weales (London: Penguin, 1996). All quotations from Dominic Cheung’s Death of a Salesman come from a photocopy of the 1995 performance script (unpublished). All quotations from Gilbert C. F. Fong, Shelby K. Y. Chan and Hardy Tsoi’s Death of a Salesman come from a photocopy of the 2006 director’s script (unpublished). This writer owes her gratitude to Mr. Cheung and Mr. Tsoi for providing the scripts. All back translations from Chinese to English are done by this writer, unless otherwise stated. Asia Times. 2005. ‘Gudu de tuixiaoyuan’ shifou Zeng Yinquan de suming 「孤獨的推銷員」是否曾蔭權的宿命 [“Lonely salesman”: The fate of Donald Tsang? ], 2 June 2005. Also on the official website of Asia Times. http://www.atchinese.com/index.php?option=com_content&view=article&id=1269&catid=121&It…. Accessed 16 May 2010. Jacobson, Irving. 1975. Family dreams in Death of a Salesman. American literature 47(2): 247–258. http://www.jstor.org/stable/2925484. Accessed 9 May 2011. Miller, Arthur. 1999. Salesman at ‘50’: In Arthur Miller’s own words. In his Death of a Salesman: 50th anniversary edition. London: Penguin. Also on the official website of Robert Fall’s 2005 production of Death of a Salesman at Lyric Theatre, London. http://www.deathofasalesmanlondon.com/study_miller_at_50.asp. Accessed 5 May 2010. Roudané, Matthew C. 1985. Interview with Arthur Miller. On the official website of “Death of a Salesman by Arthur Miller at the Lyric Theatre, London.” http://www.deathofasalesmanlondon.com/study_miller_interview.asp. Accessed 5 May 2010. Tsoi, Hardy 蔡錫昌. 2006. Gushi jianjie 故事簡介 [Synopsis]. Programme of Tuixiaoyuan zhi si 推銷員之死 [Death of a Salesman]. TNT Theatre 眾劇團, Hong Kong, 22–24 September 2006. Also on the official website of the production. http://www.tendesign.com.hk/death/s.html#ss. Accessed 23 May 2010.